Désolé, le calendrier VRBO ne gère pas plusieurs options de location sur une même maison, vérifiez donc la disponibilité. L'unité des invités a une cuisine complète et un coin salon et deux très grandes chambres. 85 $ ou 560 $ / semaine 15 $ / pers pour plus de quatre personnes. Il y a des douches intérieures et extérieures et l'accès à la plage privée. La maison à l'étage a 2BR et Master Suite, LR, DR, blanchisserie, cuisine, TV par satellite dans MBR et LR le prix est de 1750 $ / semaine. Si vous avez seulement besoin des 2 chambres avec les 3 lits superposés et le lit queen, le prix est de 1200 $ / semaine. Vous pouvez louer les unités 3BR à l'étage et 2BR en bas pour 2300 $. Vérifiez auprès de moi car le calendrier bloque toute la maison lorsque l'unité réservée aux clients est réservée, de sorte qu'elle peut être disponible. WIFI dans toutes les chambres. Utilisation gratuite du matériel de plongée, des chaises de plage, des parasols et du matériel de pêche. Demandez des rabais sur les sorties de pêche et les leçons de kitesurf. Louez un VUS Lexus pour 45 $ par jour ou 275 $ par semaine. J'ai deux VTT 4X4 que je loue à 50% des magasins de location de quad locaux. L'endroit est trop cool, et essentiellement sur la plage car c'est sur l'accès principal à la plage à seulement 20 mètres de la plage. Comprend les écrans plats en LR et 2 BR, le wifi et le téléphone Vonage. La plage est la plus belle plage de baignade de la région. C'est la valeur dans la région de loin. Profitez de la piscine, du bar immergé, du restaurant et des services de spa du Buena Vista Hotel, situé à seulement quatre maisons en bas de la plage. Vous serez les bienvenus là-bas. Des jet-skis, des kayaks et des bateaux charter sont disponibles à l'hôtel. A l'étage (maison principale) a joint la suite principale et 1/2 salle de bain dans le salon. En bas a salle de bain privée complète. Cool Spa House is a pleasant place to stay! The owner is a relaxed person, easy to deal with and very accommodating. The two room suite we stayed in is simple, but had everything we needed to enjoy a few days at the beach. This place is a good bargain because while the rooms and furniture might not be fancy, everything was clean and functional. Also, while the house is not right on the beach, it’s just one house in, so a very short walk of about 50 feet gets you right to a beautiful, white beach. All in all, we enjoyed our stay, and we would definitely stay here again! I was pleasantly surprised as soon as we arrived. Inside and out, this home is spacious, nicely decorated and well appointed. Location could only be improved if it was directly on the beach. As it sits, it is about thirty seconds to the beach and has fabulous views from the upstairs living area. We had a few very minor problems which were quickly and easily dealt with. Kelly was especially helpful and responsive. We rented the lower part of the house...2 bedrooms, a bathroom, and a kitchen. There was also a wonderful outdoor courtyard that sort of served as our living room when it was nice outside. Jeff (owner) was wonderful to deal with and his friend, Kelly, who sort of manages the property locally was very helpful too! This property is about a 7-minute drive out of Los Barilles, so you really need a car in order to stay here. The beach is amazing! We even saw a mama turtle come up and lay her eggs! It's a quiet neighborhood and people were very friendly. We had two problems: the Internet didn't work (so neither did the TV), and the door was broken. Jeff tried his best to get both things fixed, but Mexico is Mexico. The Internet was never fixed while we were there, but the door (which wouldn't lock and would barely close) got fixed on our last full day there. Luckily, it's a very safe area and we had no problems, although we locked our extra cash and our passports in the trunk of our car. Several of the amenities (like washer/dryer) listed are really only for the upper floor rental or entire house rental, so keep that in mind if only renting the lower area. All in all, we had a great time visiting this part of Mexico for the first time and Jeff did his best to make sure our stay was good! We would definitely rent from Jeff again if we ever head back to this area! This was a great rental! Very clean and right by the beach - literally a 50ft walk. It also included a few sets of snorkel gear, beach chairs, umbrella and beach towels. Owner Jeff has great local knowledge of the area. 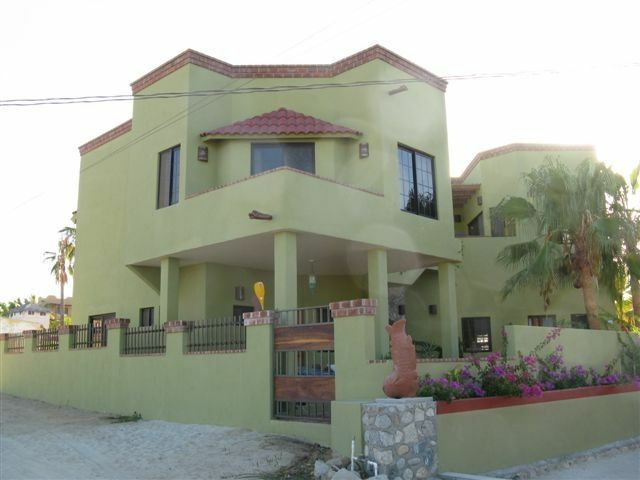 House is centrally located and a quick 5-10 minute drive to Los Barriles for awesome tacos. We'll be back next year. Jeff is a great host. His house has everything you could want !! We will be back !! We stayed in Jeffs home the week between Xmas and New years. A very nice large home. Close to beach .and a very safe area. Beautiful view from the rooftop. . Jeff is just a text or phone call away. He will respond immediately His caretaker and wife are amazingly helpful. She is also a gourmet cook and will get your groceries and cook for you for a very reasonable per plate charge. This is in addition to cleaning it up after. He is very lucky to have them. Jeff has two four wheelers you can rent by the day. So much fun. You can ride them on the beach and almost anywhere.. He has a car you can rent but we just used taxis in case you dont want to drive. Very reasonable.the washer and dryer were a nice amenity. We had the whole house but can be booked as two seperate units each sleeping 4.. Two would have to sleep on a fold out couch. If you stay remember there are just two double beds in the downstairs unit. No fold out couches. It sleeps four. Unless maybe if you have more people he brings in something.. Could use a bit of a cleaning throughout but fine for us. As we were on vacation and who wants to be inside in Mexico. Many areas to sit and lounge in his private yard. Had everything you could need without dragging everything from home. Our family of 6 had a great time. The resort just a very short walk on the beach is awesome. Allowed to use their pool .On windy days when we didnt want to be on the beach we went there.They also have a reasonable priced restaurant and swim up bar and an indoor bar that we enjoyed. A small store on the way into his area for groceries but anything major you would want to get in town. All in all a great personable, funny, owner and caretakers that treat you as friends. They keep an eye on things without being intrusive. Thank you much Jeff. Circuits VTT à proximité. Location comprennent l'utilisation temporaire de l'Hôtel Spa à seulement 3 minutes de marche de la plage. Piscine, bar, restaurant, Masseuse. Rates for entire house $225 night $1450 week $3850 month.